The new issue of Total Access can be found on the Total Access web page. Read the latest issue of Total Access. 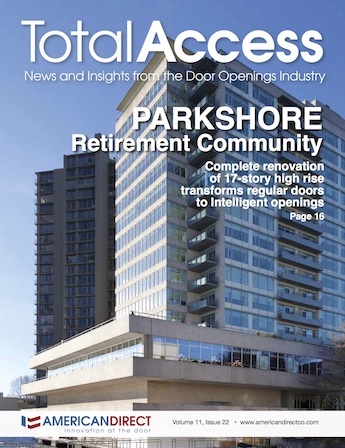 Total Access delivers news and insights from the door openings industry, including the latest on totally integrated safety and security projects, emerging trends, and valuable resources for general contractors, design teams, security professionals, end users, and commercial integrators. This issue showcases not only how American Direct has become the national leader in totally integrated safety and security solutions, but why we are the obvious choice in creating safer and more secure spaces for people to work, learn, and live. The Parkshore Retirement Community story showcases a new way to deploy intelligent locks through the pre-programming and pre-installation of locksets prior to shipping to the jobsite, saving time and money for everyone involved in the project. For the Community Memorial Hospital project in Ventura, CA, American Direct provided both the Division 8 product (doors, frames, hardware) and the Division 28 access control solution, AccessNsite, making this yet another totally integrated safety and security project. Special attention was necessary on this job due to the myriad safety and security requirements of a hospital and the rigorous building specifications in the state of California. American Direct President, Byron Whetstone, examines the question of who owns the door in Race for the Future: Who Owns the Door Opening? Building Trust Through Transparency: An in-depth look at American Direct’s online project intelligence portal ClientLINK and how real-time project information empowers customers. Subscribe to be notified by email when the next issue of Total Access is available online. Subscribe now.